What was Jesus doing on Holy Saturday, the day between his death by crucifixion and his first Resurrection appearances that Easter Sunday? I started to suggest an answer in my post When did Jesus come back to life?, but I realise that my proposal raised more questions than it answered. I also touched on the issue in yesterday’s post The Communal Resurrection of Jesus. But there is more that needs to be said here, partly in response to the comments on those two posts. 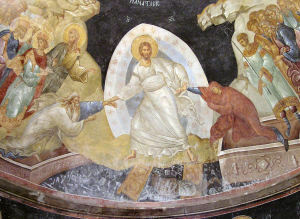 So, although Holy Saturday has passed for another year (except for Eastern Orthodox believers who celebrate it this coming Saturday), here is another post about what Jesus might have done on that day. First, what happened on Friday afternoon? After hours on the cross, Jesus cried out “It is finished!”, and committed his spirit into the hands of God. His body then died, and its death was proved by the Roman soldiers. The lifeless corpse was taken down from the cross and buried in a tomb. The tomb remained sealed until Sunday morning. But this does not imply that the soul and spirit of Jesus were dead or annihilated. The biblical picture seems to be that when humans die their souls leave their bodies and go to a place of the dead, known as Sheol or Hades. This is not a place of punishment, but one of shadowy but apparently conscious existence. And the Christian tradition reflected in the Creeds, with somewhat obscure biblical support (Acts 2:31, 1 Peter 3:19, 4:6), is that the soul of Jesus also went to Hades (for which “hell”, in older English versions of the Creeds, is a misleading translation). But apparently Jesus went there not to rest like the other dead, but to announce his victory, to preach the gospel, to break open the gates of Hades (compare Matthew 16:18), and to set free at least some of those held captive there. He seems to have transformed Hades into the Paradise which he promised to the repentant thief on the cross (Luke 23:43). 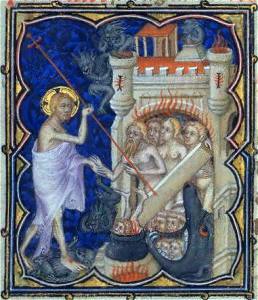 This is the traditional doctrine of the Harrowing of Hell. But when he did this, was Jesus dead or alive? Or is that question meaningful? Clearly his body did not go to Hades, which is not a place for material bodies. But his soul never died, for human souls never die when their bodies do. The apostle Peter seems to teach that Jesus went to Hades after he had been “made alive in the Spirit”, or “… the spirit” (1 Peter 3:18-19). Perhaps Peter means that Jesus was spiritually alive while this happened, but his body was still dead. Or Peter could mean that this took place after his Resurrection, but this would make the sequence of events even more obscure. So what did happen to Jesus’ body? A normal human body would have started to decay immediately, and would soon have started to smell (compare John 11:39). But we read that the body of Jesus did not decay (Acts 2:31). Instead, as the apostle Paul writes, it seems to have been transformed into a new resurrection body, in a process analogous to a seed being planted and growing into a new plant (1 Corinthians 15:36-38). But just as in the natural this process takes time, so we can understand that time may be needed for this spiritual transformation of a body. Meanwhile what happened to those whom Jesus released from Hades? At least some of these people can probably be identified with the “holy people who had died” who appeared in Jerusalem after Jesus’ Resurrection (Matthew 27:52-53). Now these people, unlike Jesus, had presumably mostly been dead for a long time, so their bodies would have decayed, and their bones had most likely been collected into ossuaries, according to the practice of the time. I suppose we must imagine these ossuaries breaking open, and the bones arranging themselves into skeletons and then putting on flesh, as in Ezekiel’s vision of the dry bones coming to life (Ezekiel 37:7-8). But this was a process which might have taken some time. So perhaps I will take back my suggestion that on Holy Saturday Jesus and these “holy people who had died” were simply resting and waiting for Sunday morning. Rather, the living soul of Jesus was busy freeing the souls of these saints from Hades, while in tombs on earth he was preparing their new resurrection bodies along with his own. To take the idea from Phil Groom’s comment, that day was a time not for “Rest in Peace” but for “Resurrection in Progress”. Then on Sunday morning the souls of Jesus and the other departed came together with their new bodies, and the great Resurrection took place, of Jesus and together with him of the Old Testament saints. The Irish theologian John Dominic Crossan is not one I would normally read or agree with. But for Easter last year he wrote an article which makes an important point for the Huffington Post, The Communal Resurrection of Jesus. … But is not Easter about the absolutely unique resurrection of Jesus alone, so why are any others involved and, if others, why precisely these others? The answer reveals a major difference between Easter Sunday as imagined and celebrated in Eastern Christianity as opposed to Western Christianity. It also reveals for me the latter’s greatest theological loss from that fatal split in the middle of the eleventh century. Crossan doesn’t properly explain this theological loss – and if he did, I might not agree with him, as he is reported as rejecting the bodily Resurrection of Jesus. But he is clearly hinting that the Western tradition has lost sight of the communal aspects of the Resurrection. As the Eastern tradition correctly remembers, Jesus did not rise from the dead alone, but he raised to life with himself all those who believe in him, right back to Adam and Eve. This of course ties up with the odd story of the resurrection of the Old Testament saints in Matthew 27:51-53, which I discussed yesterday in my post When did Jesus come back to life? So, when Jesus rose from the dead he raised with himself not only the Old Testament saints but also, in anticipation, all of us New Testament believers. We may not yet have our Resurrection bodies, but we already have within us the Resurrection life of Jesus. The time is past when “we were by nature deserving of wrath”. Now we are alive and seated with Christ in the heavenly realms. We must not forget that, but live according to that truth. When did Jesus come back to life? At that moment the curtain of the temple was torn in two from top to bottom. The earth shook, the rocks split 52 and the tombs broke open. The bodies of many holy people who had died were raised to life. 53They came out of the tombs after Jesus’ resurrection and went into the holy city and appeared to many people. From the next verse it is clear that the earthquake took place immediately after Jesus died, and before he was buried. But the timing here is hard to pin down. The most straightforward interpretation would be that the opening of the tombs and the raising to life of the dead holy people took place at the time of the earthquake. The timing of them coming out of the tombs is unclear, but it is only after Jesus’ resurrection, so at least 36 hours later, that they appeared to many people in Jerusalem. Now I know that many scholars, including some evangelicals, consider this story to be a myth. Last year there was a major controversy when evangelical author Michael Licona suggested the possibility that this passage is “apocalyptic imagery rather than describing historical events”, and Norman Geisler and Albert Mohler condemned him for abandoning biblical inerrancy. This is in fact irrelevant to my point here. What is important is the use that the author of this Gospel makes of the story. Nolland speculates as to what happened after to the risen saints. He considers it unlikely that they simply returned to the grave after a brief time among the living, he also does not think it likely that the saints resumed their normal lives on Earth. Thus Nolland feels that Matthew probably imagines the saints being translated directly to heaven after a short time on Earth, similar to Elijah. We could also end this quotation “similar to Jesus”, although these saints probably ascended to heaven not as many as 40 days after the Resurrection. But on this interpretation, the raising of these saints was not a temporary resuscitation like that of Lazarus, but a resurrection like that of Jesus, and like the one which we Christian believers can expect on the last day. But there is a theological problem here. If Jesus was indeed raised from the dead as “the firstfruits of those who have fallen asleep”, the first in time to be resurrected (1 Corinthians 15:20,23), then how could others have risen before him, even if they had to wait for his resurrection before appearing publicly? Or could it in fact be that the resurrection of Jesus was just like that of the Old Testament saints, in that he too came back to life immediately after he died, but only came out of the tomb on the third day afterwards? Yes, Paul does write that “he was raised on the third day according to the Scriptures” (1 Corinthians 15:4), but that could mean only that he first appeared on that third day. To go back to Jeremy Myers’ question Why Did Jesus Wait Three Days to Rise from the Dead?, in my opinion the best answer to that question is given by Kurt Willems in his post The Easter Surprise – Resurrection Changes Everything (reposted at Red Letter Christians as The Easter Surprise: Celebrating the first day of a new kind of week). Jesus by rising again is inaugurating a new creation. So it is significant that his work in the old creation was finished on the sixth day of the week he had spent in Jerusalem (here reading the gospel chronology in the traditional way); he rested in the tomb on the seventh day; and then he rose again for the new creation on the first day of a new week. But on the seventh day of the original creation week God was not dead, only resting. Jesus too would have had plenty of reason to rest after his work on the cross was finished. So within this framework it makes sense if Jesus was also not dead but resting. Now I am certainly not denying that Jesus truly died. The New Testament makes this clear. It also seems clear that he was dead when his body was put into the tomb and sealed up. On that basis the Old Testament saints could have come to life immediately after Jesus, slightly out of chronological order in Matthew. But we don’t know what happened between then and Easter morning. So we don’t really know if Jesus was dead, or was alive and resting. But theologically it might make sense that he was already alive, and waiting for the right time to present himself as such and start his work of new creation. Cross or Resurrection 1: Which is Determinative? Cross or Resurrection 3: What about Jesus’ life? Cross or Resurrection 4: The Centrality of the Cross? In each of the preceding posts, apart from the opening one, I warned against the dangers of taking one aspect of the faith, and of the New Testament narrative, as the central focus of Christianity and as determinative for the Christian life. In each case I named a particular stream within the church which sometimes strays too far in focusing on one aspect to the neglect of the others. The key to the Christian life is to find the right balance between these matters. Each of them is important and indeed necessary for a proper Christian life. But no one of them is important enough to be the central focus, or to cause the others to be neglected. The Christian life must begin with repentance and forgiveness, made possible through the Cross, and continue with the new life inaugurated by the Resurrection and empowered by the Holy Spirit – always taking Jesus’ life on earth as an example but remembering that he is now reigning in heaven and will come again at the end. If anything here is missed out, there is a serious imbalance which needs to be corrected. 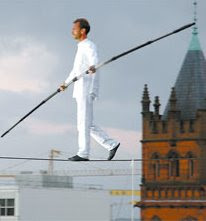 But if we keep the right balance, the Christian walk is a straightforward, if not always easy, one. This series on what is determinative for the Christian life started with John the Baptist and continued with the life and teaching of Jesus and with his death on the Cross. Now I want to consider whether the Resurrection and Ascension of Jesus Christ should be considered the central focus for the Christian life. This is an emphasis which is sometimes seen as characteristic of Eastern Orthodox Christianity, in contrast to the western churches which tend to put more emphasis on the Cross. To be honest I don’t know how true this is of Eastern Orthodoxy in general, but it does seem to be reflected in the prominence of the image of Christ Pantocrator in Byzantine and more modern Eastern church buildings. The Jesus in these images is not living on earth or dying on the Cross; he has risen and ascended and is reigning as the Lord Almighty. The Christian life, therefore, is not to be one of subjection to a heavenly tyrant, ruling through his regent on earth the emperor. Yes, the emperor may reign, and Christian people are to honour this rule in earthly matters. But in spiritual matters, although Christ is indeed King, his reign has a very different character, one which involves humility and self-sacrifice, demonstrated and shaped by his life on earth and his death on the Cross. If these are lost sight of in worship of the heavenly Christ, again the Christian faith has lost its proper balance. Nearing the end of this series, continued in Cross or Resurrection 6: New Life After Pentecost. This is a continuation of the series starting with Cross or Resurrection 1: Which is Determinative? Sorry this has taken some time to appear. I was interested to read a news article, linked to by Joel Watts, about Mandaeans who have found refuge in the USA. It seems that the little known religion of Mandaeism, until recently most widespread in Iraq, is now flourishing in a small way in Massachusetts. The chief prophet of their religion is none other than John the Baptist, and they practice baptism, weekly in rivers. However, they reject Jesus as a false Messiah, and the Holy Spirit as an evil being. Mandaeism in fact seems to be a surviving Gnostic sect with its roots in the early centuries AD. Already in the time and region of Paul’s journeys related in the book of Acts there seem to have been widespread groups of “disciples” who “knew only the baptism of John”, among them Apollos (Acts 18:24-25) and a group Paul met in Ephesus (19:1-6). These were not Mandaeans, as Apollos already knew about Jesus, and the Ephesus group were quick to listen to Paul’s teaching about him and accept the Holy Spirit. But it is not fanciful to see a real continuity between those among these groups who never accepted the Christian gospel and the modern Mandaeans. So, for Jesus, John is greater even than the Old Testament saints, but he is still outside the kingdom of God. And I would suppose that Jesus would say the same about his followers, those who only know his baptism, whether ancient “disciples” or modern Mandaeans. Indeed that seems to have been Paul’s understanding, for he baptised the “disciples” again, this time in the name of the Lord Jesus (Acts 19:5). It was only after that that the Holy Spirit came on them, with gifts indicating that the kingdom of God was breaking into their lives. The law … can never, by the same sacrifices repeated endlessly year after year, make perfect those who draw near to worship. 2 Otherwise, would they not have stopped being offered? For the worshipers would have been cleansed once for all, and would no longer have felt guilty for their sins. 3 But those sacrifices are an annual reminder of sins. 4 It is impossible for the blood of bulls and goats to take away sins. Similarly, baptism for repentance has no power to change those who repent, if they do not go on to accept the message of Jesus and the gift of the Holy Spirit. The Mandaeans clearly do not believe that through being baptised once they have been “cleansed once for all”, as they undergo baptism as a weekly ritual. We acknowledge and bewail our manifold sins and wickedness, Which we from time to time most grievously have committed, By thought, word, and deed, Against thy Divine Majesty, Provoking most justly thy wrath and indignation against us. When the priest offers the absolution, they believe that their past sins have been forgiven – but also that they are expected to continue to sin, so they have something to confess the next Sunday. Clearly this kind of repeated ritual is no more effective than Old Testament sacrifices or Mandaean baptisms, as it cannot “make perfect those who draw near to worship”. If we claim to be without sin, we deceive ourselves and the truth is not in us. 9 If we confess our sins, he is faithful and just and will forgive us our sins and purify us from all unrighteousness. 10 If we claim we have not sinned, we make him out to be a liar and his word is not in us. But note those words “purify us from all unrighteousness”. Neither animal sacrifices nor repeated baptisms can do this. Nor can a declaration of forgiveness which comes with an expectation that more sins will follow. The Cross of Christ can bring forgiveness of sins, but apart from the Resurrection the only righteousness it can bring is that of death, of someone who cannot sin because they are dead. As John the apostle writes, a person can live a righteous life if and only if they are born again of God, if the life of the risen Jesus is within them. So if we live by the Cross without the Resurrection, we are no better off than John the Baptist, forgiven our sins but still outside the kingdom of God. But if we leave our expectation of continuing to sin at the Cross and move on to take hold of the life of the risen Jesus, the kingdom of God is within and among us, and we can bring it to the world around. Continued in Cross or Resurrection 3: What about Jesus’ life? See also Cross or Resurrection 2a: Stop confessing your sins!